So yesterday I told you that I was about to try to squeeze a quart into a pint pot if you remember. Or more specifically I had the dilemna of having a massive amount of packing to do to get into a very small bag. The issue is that when I get to Kathmandu, my bag for the trek is weighed at the hotel, and can only weigh 12kg – yes you heard me correctly! 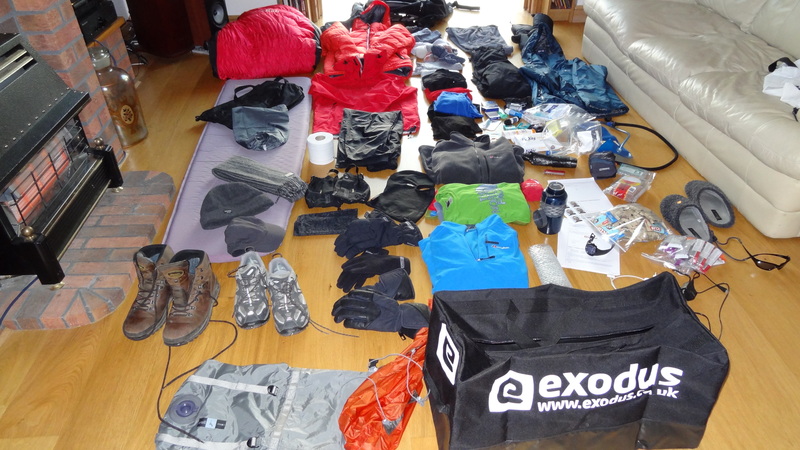 That’s all of my kit for a 22 day expedition, all clothes, waterproofs, sleeping bags, boots, down jackets, equipment, the lot. I can tell you that my sleeping bag and Thermarest alone weigh about 3kg, and my various electrical items close on the same. It’s not even close to being funny. It all has to fit into a very small space too – i.e. the ‘expedition bag’ they gave me for the trip. When I was told I was being sent an expedition bag I originally thought ‘oh good, a nice new bag, I could always do with one of those’. Then when I saw it I just laughed – it must hold about 50 litres max, and thought ‘no way’. Then I was told that my stuff had to fit into this bag for the trek, and could weigh not a gram more than 12kg, and so I knew I was in trouble. It almost leaves me with wearing the same exact clothes for all 22 days, and whilst I expect to be ponging to high heaven by the time I make it back to Kathmandu, there are limits as to how long you can live in the same pair of underpants – please! Heading in the right direction at least. So I reckon that after a day of huffing and puffing (and believe me, compressing a sleeping bag and Thermarest takes it out of you in my living room, and so doing this at altitude with no oxygen is going to be a killer) I have it do I can get it all into the bag, just. All good I thought, so let me weigh it. And the answer is……..18kg. Yep, that’s without the boots as I’ll be wearing those, and without toiletries, as I haven’t packed them yet. Oh and it is without underwear, or any clothes other than those I listed in yesterday’s post, i.e just my trekking pants and fleeces and things. I was about to throw everything out of the window in the end. I then had to think about my stuff for Island Peak, as this is excluded altogether from the above. Oh Lordy! Now the one on the left is technically the only one that fits the bill, as it is a Berghaus 45+8 sack, and has as many attachments and pockets as you could wish for. The one on the right is the one I used for Switzerland in the summer, it’s a Deuter 35+ and has the bells and whistles too (if not all of the room). It is a great climbing sack, but not a great one for trekking though. The one in the middle is a Sprayway 30, and I love it, but it has no ice axe straps. If I was just trekking to base camp I’d take the Sprayway, without hesitation. It is the most comfortable, has great access, has outside bottle holders etc etc. If I was just climbing I’d take the Deuter – it is made for ropes and axes and helmet etc, and I know it fits the bill. 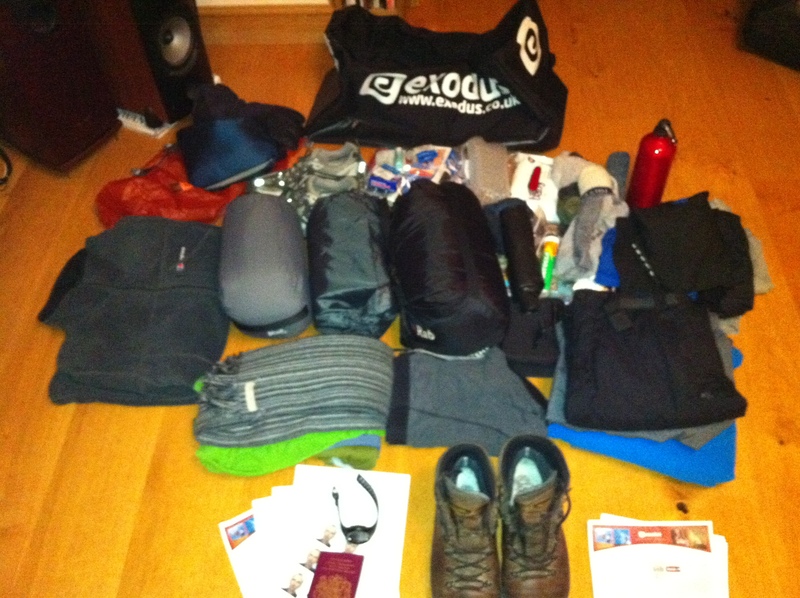 If I read the kitlist properly then I should go for the Berghaus, as it is the only one that fits the spec. But then…..the list goes on to say that your total baggage of 15kg should be divided into your kit bag and rucksack, with the kit bag to weigh ‘no more than 12kg’. Now this means that the rucksack can weigh no more than 3kg. 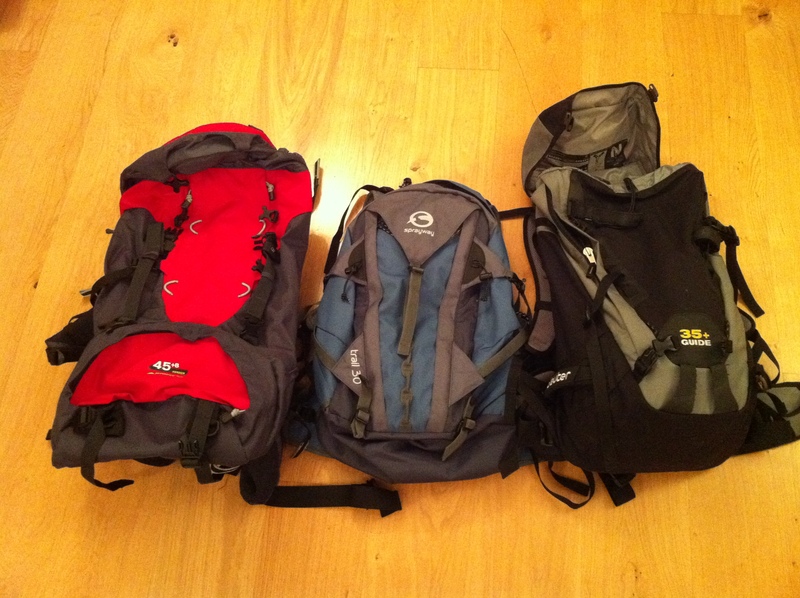 I can tell you that I weighed each of these this evening, and the Berghaus weighs 2.1kg on its own. Totally empty. That means I can fit in like a pair of sunglasses and maybe a bar of chocolate if I’m lucky. My waterproof jacket weighs 800g, and my camera about the same including its spare batteries and the like. What do I do with suntan lotion, lip salve, water bottle, camelback, fleece etc etc etc? So I knew this was going to be a frustrating day. I really wanted to spend it trying to do some things around the house, maybe have some ‘me’ time, maybe even go out and not think about panicking about the trip at all to take my mind off it. Instead it is worse then before. I will get there somehow, I simply have to, but how?